Apple is seeking an engineer with thin films experience as applied to semiconductor or solar manufacturing, suggesting the company is investigating viable alternative energy source for future mobile products like a smart watch. 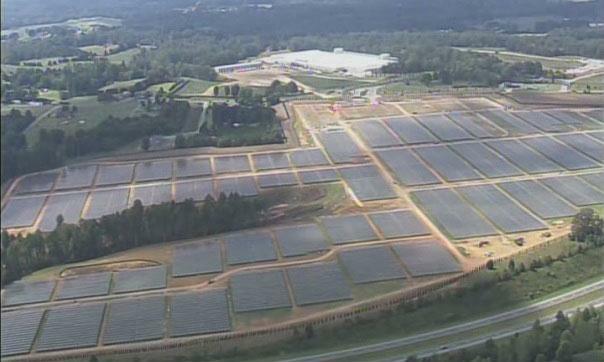 Apple's large solar array at its Maiden, N.C. data center. The post, discovered on the Jobs at Apple website, describes a position for the Mobile Devices group, with suitable candidates having experience with thin film deposition technology in either semiconductor processing or solar industries. Looking into the Key Qualifications section of the listing, which was posted on Thursday and spotted Friday, it appears that the position will deal with the applications side of R&D, rather than the development phase. Applicants are asked to have experience in sputtering, vacuum evaporation, electroplating and other technologies commonly associated with disposing thin-films on circuitry. While the word "solar" is mentioned twice in the listing, it may not necessarily mean that Apple is working to bring a solar-powered iPhone to market. Many advanced technologies require engineers to have multidisciplinary backgrounds, as these systems are intricately tied together. Perhaps most interesting is a qualification that reads, "Knowledge of thin-films in the context of RF shielding is highly desirable." This suggests Apple may be looking to develop a new method of radio interference blocking for its smartphone lineup that could possibly reduce dependence on the current metal RFI shielding seen in wireless-capable devices. As with many Apple job postings, other desirable qualities include experience in working with Asian manufacturers, problem solving skills and an ability to work as part of a team. Apple has a number of patents regarding solar-powered devices, many involving portable devices like the iPod and iPhone. Most recently, the company outlined a system that uses a display's electrodes to both collect sunlight and act as capacitive touch sensors. Solar power is becoming increasingly popular as light conversion efficiency increases, but the technology is not yet at the point where a panel can simply replace wall charging. A more likely scenario would be battery life augmentation for smaller portables, like a watch. Interestingly, Apple's smart watch patent, discovered by AppleInsider in February, directly mentions such a solution.